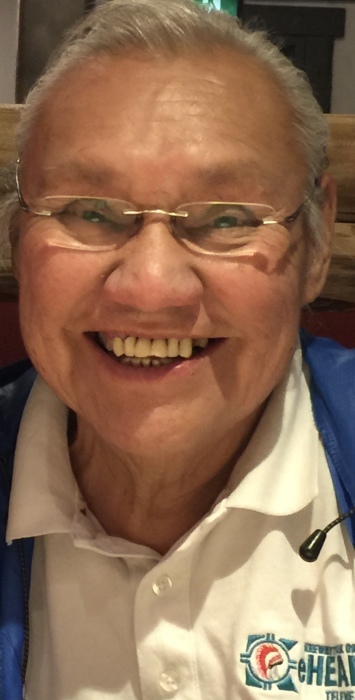 Noel Victor Starblanket, Kīsikaw Pīyēsiwēwin (Where the Thunderbirds Live), Pahpahtaywak Kīhēw (Spotted Eagle), began his journey peacefully at 72 years of age with his wife and family by his side in the early hours of April 15th, 2019 after a joyful night surrounded by relatives and friends. Born September 26, 1946 at the Fort Qu’Appelle Indian hospital, he was predeceased by his paternal grandparents Allan and Marie Agnes Starr, maternal grandparents George and Victoria Keewatin, parents Victor and Mary Starr; brothers Willard, Gerry, Irvin, Fred, (in infancy) Frances & Clayton; sisters (in infancy) Eleanor & Darlene; adopted brothers Leonard Ratt and Henry Gardipy and a son in infancy Eagle Starblanket. Revered Life Speaker, loving husband, cherished father, beloved mosom, uncle, capan, brother, cousin, mentor and friend, Noel will be missed but remembered fondly by many for his example, leadership and generosity. He is survived by his loving wife and best friend, Reona Brass (Maariu, Gabriel, Cypress, Aiden and Helana); sisters Edith, Lorraine (Maurice) and Ethel; daughters Starla, Stephanie (Jason), Vanea (Curtis), Brandi, Claudine; son Vaughan (Brittnee); (adopted children) Starlene, Cheryl, Wendal (Sonya), Kelsey (Margaret), Tammy Cyr, Kim Jonathan, Derek Starblanket, and Sheldon Poitras (Sherrie); (adopted) brothers A.J. Felix (Patsy), & Gary Alexson; and numerous nieces, nephews and other adopted family in the spirit of wahkotowin from around the world. Noel is survived notably by his most beloved and cherished grandchildren Sage, Colby, Cory, Cheyna, Jordan (Alyssa), Nathan (Whitnee), Madisyn, Ryder, Colin, Andrew, Autumn, Oki, Kimi, Pē, and Kelsey Jr.
We wish to express our gratitude to the doctors and nursing teams of 5E at Regina General Hospital and especially to Dr. Prasad for their incredibly compassionate and respectful care of Noel. The staff of Northwest Homecare are also appreciated for their wonderful care of him over the last year, as well as the File Hills Qu’Appelle Tribal Council and our own Star Blanket Cree Nation Chief and Council. At Noel’s request, a Celebration of life will be held on Thursday, April 18th at 12:00- 2:00p.m. at the First Nations University of Canada (of which he was a founder) followed by a traditional wake at 4:00 p.m. in the White Buffalo Calf Gymnasium at Lebret, SK. A funeral will follow on Friday, April 19th at 11:00 a.m. at the White Buffalo Calf Gymnasium in Lebret, SK. Interment will follow on Starblanket First Nation. Traditional Elders officiating. No children please as per traditional protocols. In the spirit of reconciliation and healing to which Noel devoted his later years, all are welcome to attend.